It’s Labor Day weekend! It’s Friday afternoon! Woo hoo, let’s have some fun. Monroe, Louisiana this week was lovely. My new job is not perfect by any means, but the group is just wonderful. We dedicated the new building on Wednesday. A local Pastor came and blessed it, us, and we all prayed over it. What a great way to launch a business channel. While in Monroe, I got some difficult news and had to head home. The changes in my airline ticket would have cost me close to $700.00. I decided to drive, and it took 4 phone calls to different car rental companies to get a car reserved. (Monroe is not a Mecca for a large rental fleet.) The last call put me in contact with a lovely woman who recognized the stress in my voice, went above and beyond customer service to get me what I needed. When I got to the Rental office, there was no car available. The returns were way over due, and she had nothing to offer me. I thought my co-worker had left, so I settled myself to wait it out in the car rental office. I turned to sit, and my co-worker walked in to check on me to make sure I had been taken care of. She took me to lunch, and brought me back just as my car was ready. The rental office took 10% off my daily rate, reduced my 1 way fee by 50%, and I got a hug goodbye. I was stressed and alone, but not for long. My new co-worker decided to double check on me. How awesome is that? The rental company recognized my need to get home, and made sure it cost me as little as possible, and put some humanity into the transaction. It was so cool. I stopped to fill up before I dropped off the car, and this young man stopped to open the store door for me, and told me he thought I was ‘beautiful’. That completely made my day. It was so random, it shocked me totally. I made it home to a nice dinner waiting for me. It’s humbling when so much kindness is heaped in one day. I’m so grateful that there is still so much goodness left in the world. Go be nice to someone today. You will never know how far those kind gestures go. Great blog post! What are you grateful for today? Me? Slow, easy Sunday morning breakfast, good message from Pastor Hagee, and sweet puppy dogs. I hope you’re having a great weekend! 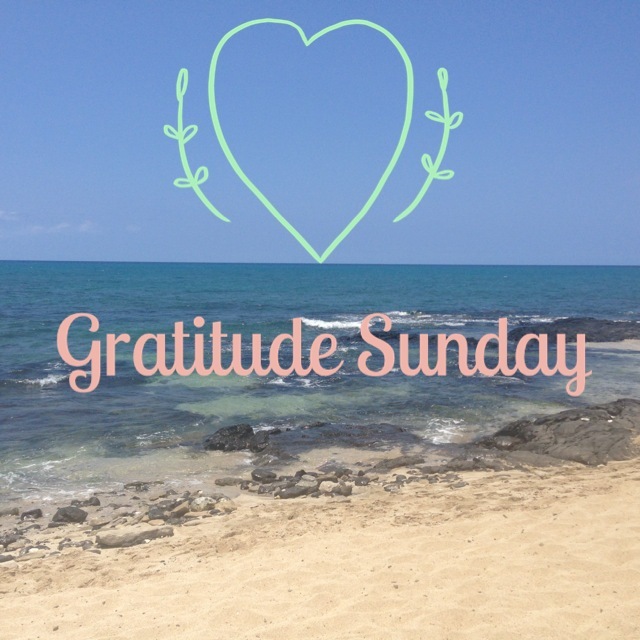 Thank you to everyone who shared what they were grateful for last week when I announced Gratitude Sundays. I love reading all of your comments! I’m happy to be home, but it was a good week overall. Two good “yeses” from two good prospects. I got caught up with my friend from Oklahoma City, Rolanda. She is so awesome. I worked hard on my upcoming 5k, and ran the furthest I’ve ever gone without stopping. I finished my best practice so far in 39.12. Don’t laugh at me! It’s slow, but I’m out there, and it’s 6 minutes faster than when I started this adventure last November. The discovery of inner strength that I didn’t know I had, encouraged me to keep moving forward. I’m coming up on a season of change; with the death of my Aunt two weeks ago, my aging parents, my 96 year old grandma, life will change. I’m grateful for good health, increased strength and stamina. I’m grateful for healthy good food to eat, and a comfy chair to unwind in at the end of the day. Quotes of the Day: Understanding. It’s easy to get distracted by the “now” and the immediacy of filling a need with what’s in front of us instead of what’s truly right. It’s a difficulty to be patient, but patience pays off. I’m grateful today that I don’t have to settle. Ever have one of those days when everything is funny? I’m having one today…..it could be the lack of sleep. This is some of the best fried veggie ever! The sauce will be used on everything from this veg to shrimp and chicken! Way out awesome good, so I had to share. It’s a wee labor intense. I recommend doing the coating on all the cauliflower, put it on a tray and refrigerate for 30 to 45 minutes before frying. Use a wok if you have it, but you don’t have to use a lot of oil to get a good crispy veg. I hope I did the link right!